Cycling as a sport or a hobby is not so popular in our country India. And myself from Kolkata, where cycling is not allowed in many streets. According to Police and other traffic officials, cycles slows down the traffic movement. But surveys say that average speed of traffic on roads of Kolkata is 22km per hour. And a cycle generally moves by that speed very easily. According to me, parking of cars and bikes makes the traffic much slower than a cycle. By the way, I don’t want to discuss about this debatable issue here. I started cycling from my school days. From then it has became my partner. I like to travel both short long distances on cycles. To be specific, I use my cycle for commuting as much as possible. I own a Hercules Cycle and it’s not a geared one. It’s a basic road bike and it is 26 years old. By profession I am a photographer and I run a photo studio at Baghajatin, Kolkata. 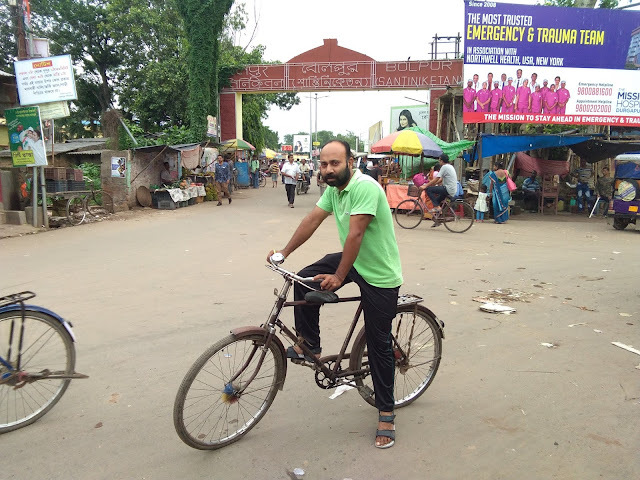 So, I reach Baghajatin from Sonarpur by cycling 20km every day. I a month I cover 600 to 900km on my cycle. Recently I was thinking to make a long distance tour from Sonarpur. And I selected Bolpur, Shantiniketan as my destination. On road the distance was 187 km from Sonarpur and getting back from Shantiniketan, the total distance measuring was 374 km. I liked the distance of covering 187 km a day. As I knew it was manageable for me. Jayanto Dey, my brother in law wished to give company for the whole tour with his cycle. He also owned a basic road bike with no gears and his cycle was not less than 16 years old. We were a bit worried about our cycle ages, whether it would be capable of covering 380 km distance or not. But we didn’t want to invest for new sophisticated and geared cycles. We serviced the cycles from a local cycle repairing shop. Finally, on 4th August 2018 we started our journey at 5 a.m. from Sonarpur. We both carried an extra set of dress, 15 packets of ORS, 12 packet of dairy milk cad berry, two liters of mineral water bottles, 6 packets of biscuits, crepe bandages, Volini spray, scissors, towels in our small travel bags. We didn’t forget to take our ID proofs also without which no hotels will entertain us for night stay. We started cycling at 5a.m. from Sonarpur and reached Sealdah 18.7 km within 6 a.m. From Sealdah we headed towards Shyambazar 5 point crossing via APC road 4.5 km. From there we continued to follow Barrackpore Trunk Rd 4.9 km. After that we Turned left onto PWD Rd for 0.6 km. We then got on Belghoria Expressway Partial toll road which was 1.4 km. and continued onto Nivedita Bridge/AH1 for 4.7 km, and passed by Haldiram's Dankuni and crossed the Dankuni Toll plaza and merged onto NH19. 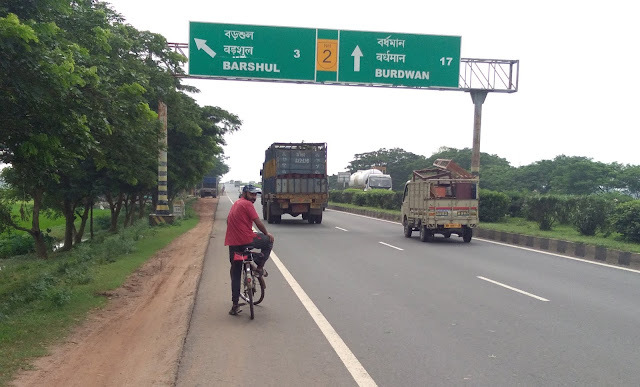 Now we were on the National Highway 19 or the Durgapur Expressway and we were to cover 90.8 km to reach Bardhaman. We took a break for half an hour to drink water and tea just crossing Dankuni Toll. It was around 7:30 a.m. when we started the longest part of our journey through Durgapur Expressway. The sky was perfectly clear and sunny. The road was fine, really smooth. Our next target was Singur for some water break. As the weather was sunny temperature was around 30°C. We were under the scorching sun, cycling at an average speed of 18-19km/hr. We planned earlier to keep this average speed for the whole tour. Buses, trucks, and private cars were passing by us like rockets…whooossss !!! At around 10:15 a.m. we reached Singur i.e. Hoogly district. We cycled few kilometers after entering Hoogly district and found a tea stall for tea and water breaks for 15 minutes. 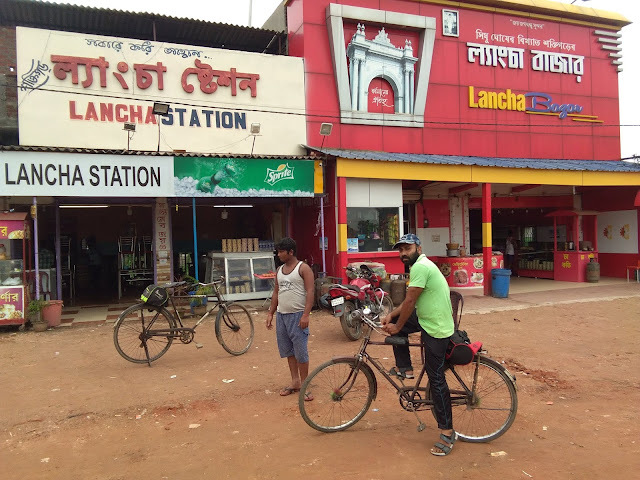 Then we continued to cycle for an hour and it was around 11: 15 a.m. we reached Azad Hind Dhaba. We got fresh and completed our lunch there and took rest for 45 minutes. It was 12:30 p.m. we again started to cycle and our target was to reach Saktigarh without any breaks in between. 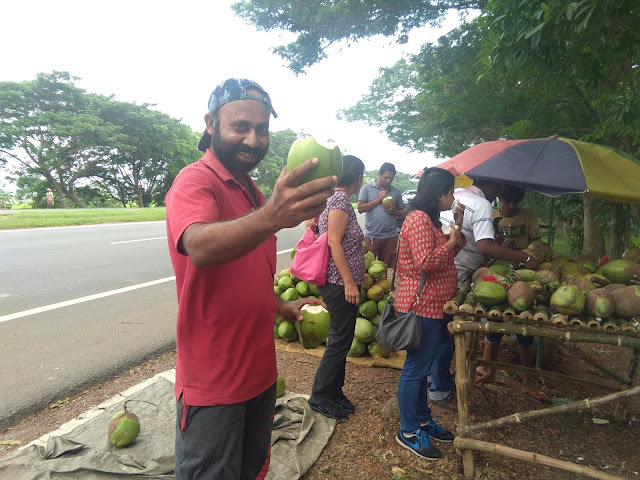 Just a few meters from Palsit Toll Plaza we found a coconut vendor and stopped there for coconut water. 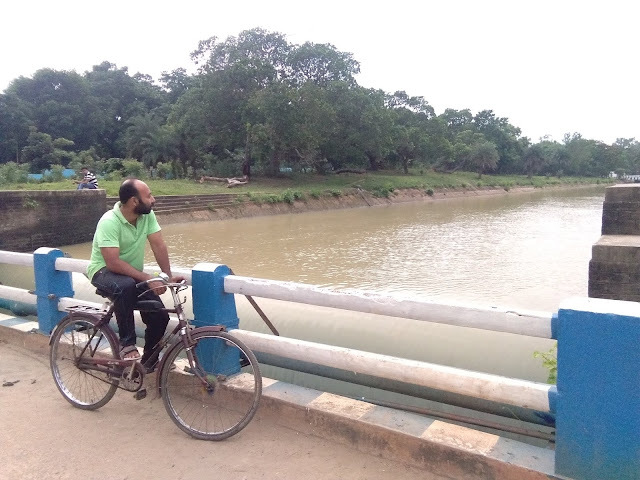 Again we started cycling, covered few kilometers and entered Burdwan District. Then we reached Saktigarh, a village in East Burdwan district. This place is famous for a kind of sweet named “Langcha”. Generally it’s a must stop place for most vehicles and tourists passing through Durgapur Expressway. We were also no exception in this issue. It was around 2:00 p.m. we reached Saktigarh. Me and Jayanto my tour partner both enjoyed some delicious Langchas’ and hot coffee. Charged our mobiles, loaded few liters of water bottles in our bags and then again started cycling after taking a 30 minutes rest. It was 2:30 p.m. afternoon . Around 4:00 we left NH 19 which was going straight towards Panagarh and turned sharp right and landed on NH 114 and reached Burdwan Market. Crossed the famous 108 Shiva Temple and headed towards Guskhara. We were really tired at that time, as we have cycled 128 km from Sonarpur to reach Burdwan Market. We decided to to take a tea break. We were using Google Maps so mobile charges were being consumed heavily. We requested a shop for charging our mobiles and we got the help. 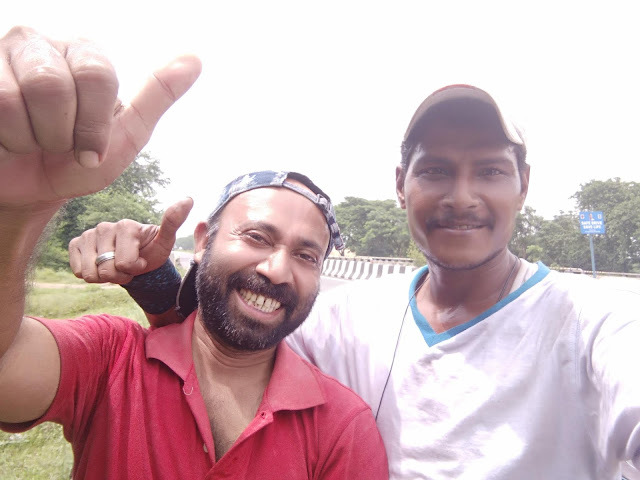 We were getting late too, as after few hours it will get dark and Guskhara was 32km from Burdwan Market and to reach Shantiniketan it was more 28km. Total 50km we need to cycle to reach our destination. The main problem was, we had no lights on our cycles to carry on cycling in the dark. For that we will have to depend on street lights and other vehicles lights. Around 4:45p.m. we again started cycling to reach Guskhara. Now we started to follow the milestones, as every kilometer and time became very important at that time. After an hour of cycling we found that the Sun is setting and we have to cycle in darkness. Still Guskhara was 13 kilometers to reach. There was no sign of houses beside the road. It was miles of farmlands and marshy lands here and there. We also found few police vans….that means the road was not safe. We were so tired that we were cycling at a speed of 10 km per hour or may be less than that. Then my partner suggested having a light meal to get charged up. But I was concerned about the time, darkness and destination point. Now we found a small dhaba. We took a roti and tarka there. Asked the owner whether the road is safe to cycle in dark or not. He confirmed us it’s a safe area. After taking break we started our journey around 6:30p.m. And it was dark out there. Now we speeded up and cycled at a speed of 25km per hour or more, as we were bit stressed for getting late to reach our destination. We reached Guskhara, a small town in Birbhum District. It was around 7:00 p.m. then. 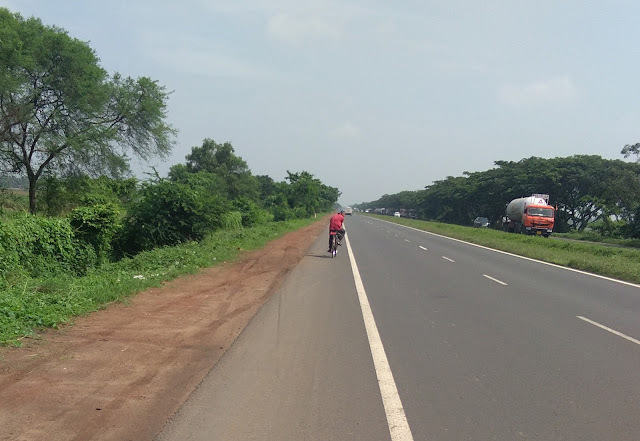 We crossed Guskhara and headed towards Bolpur, Shantiniketan keeping our average speed at 20km per hour. Still we need to cover 26km more to reach our destination. It was dark and we were cycling carefully avoiding the potholes. Took help of available light source from other vehicles crossing us. And then we crossed the Bhedia railway underpass. Luckily no water logging was there, as its very usual in monsoon seasons. So we crossed it without any difficulty. 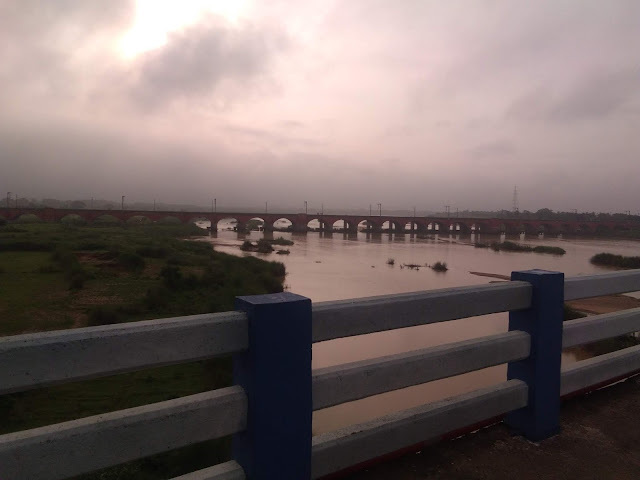 Crossed the Ajay River Bridge and finally we reached Bolpur at around 8:15 p.m. We covered total 187km in one day and reached Bolpur Shantiniketan. It was a great distance for us to cover in one day being our first cycle tour. As we had no prior booking in any hotels it was another issue to find a room for a night. We went to few hotels and there were no rooms left for us. Finally it was 9p.m. 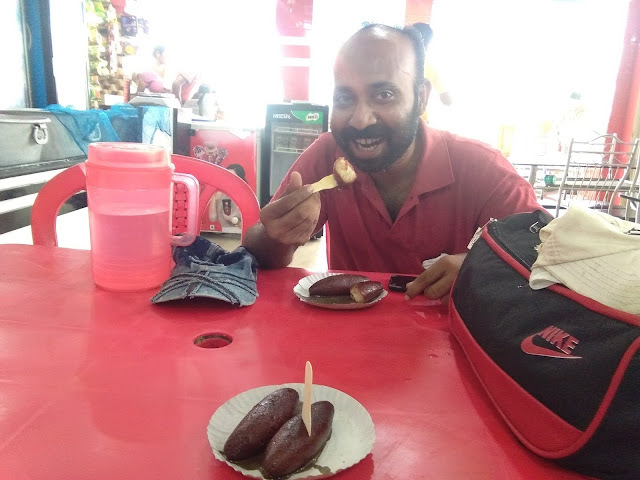 we found a budget lodge near Shantiniketan Railway Station and took dinner and rest for that night there. We kept our cycles at a cycle garage near our lodge. The hotel owner and cycle garage owner was astonished to hear that we arrived from Kolkata by cycling. 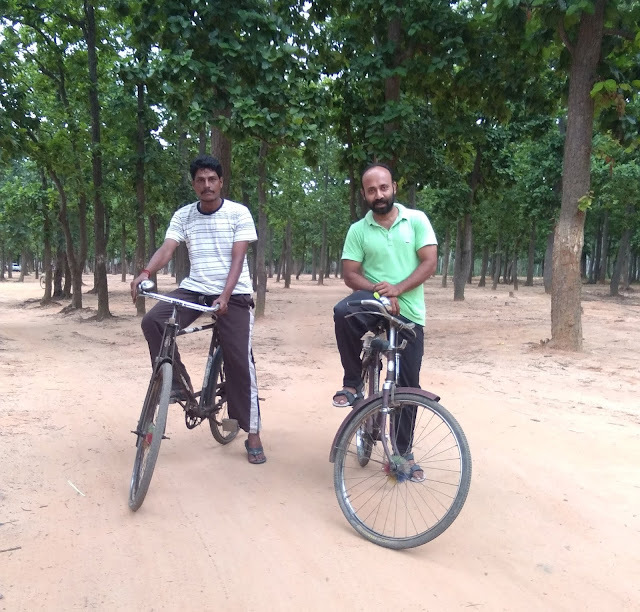 Next Morning we woke up and decided to stay back here for the day to visit the surrounding areas of Shantiniketan on our cycles. We went to Sonajhuri Forest, a forest full of Eucalyptus and Saal tress. 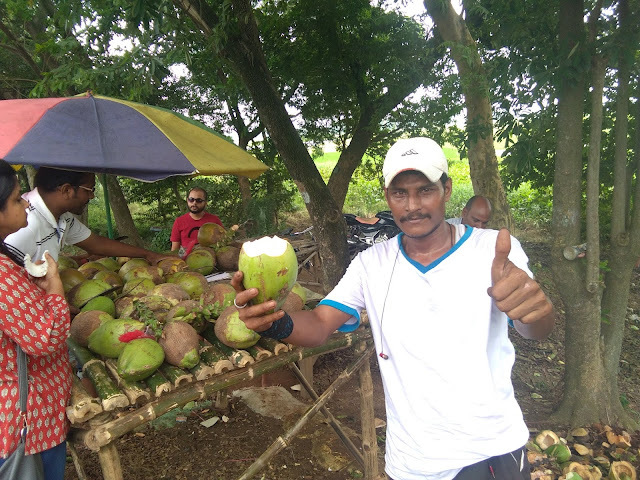 We went to the famous Khoai Haat, where local people sell their hadcrafted products; folk singers entertain the tourists by singing Baul songs. 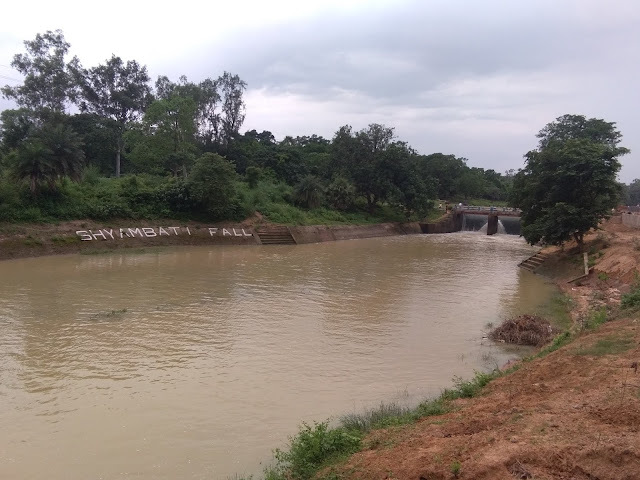 We saw a small water fall near Shyambati canal named Shyambati Falls. 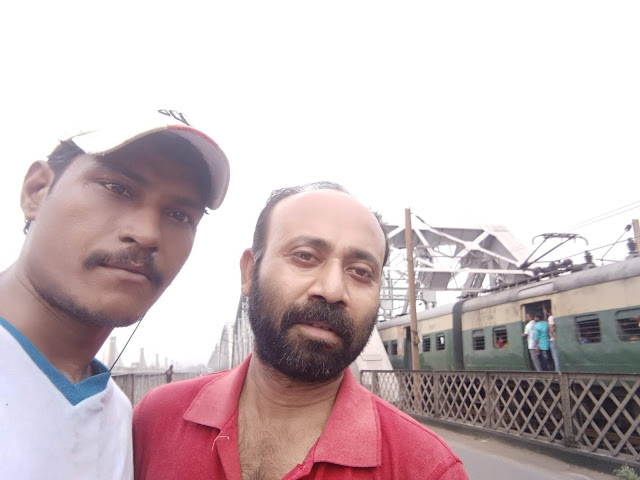 It was 6th August 2018 early morning, Again we started our Journey to get back to Kolkata. Again we will have to cover the same 187 km to reach Sonarpur. We took the same road and route to return. At around 9:30p.m. we reached our home in Sonarpur. During the return journey, wind and rain was a factor which resisted us. Still we succeeded to cover a 374 kilometers of journey with our old and basic bicycles. Overall it was a great experience for us. We enjoyed the roads, foods, peoples and nature while travelling. And our journey will continue in the coming days, on cycles. To me sophisticated and up-to-date bicycles are not important. If anyone is dedicated nothing can stop. Long distance cycling needs only proper planning, will power and strength. Success is guaranteed.